Ignatius was born in 1491 at Loyola in Guipuzcoa. After spending some time as a courtier, he turned to a military career. In 1521, while convalescing after a wound received at the siege of Pamplona, he suddenly conceived a burning desire to follow the footsteps of Christ. His spiritual experiences during his retreat at Manresa were to provide the core of his book 'Spiritual Exercises'. In 1537 he was ordained in Venice, and in the same year moved to Rome. There, in 1540 he founded the Society of Jesus, and in the following year was elected its first General. In every kind of apostolic work he contributed greatly to the Catholic revival of the sixteenth century and to the renewal of the Church's missionary activity. He died in Rome in 1556, and was canonized by Gregory XV in 1622. The Bangalore Jesuit Educational Society is a registered Society under the Society of Jesus, a Catholic religious order founded in 1540 by St. Ignatius of Loyola. Its members, popularly known as Jesuits, have been active in the field of education throughout the world. 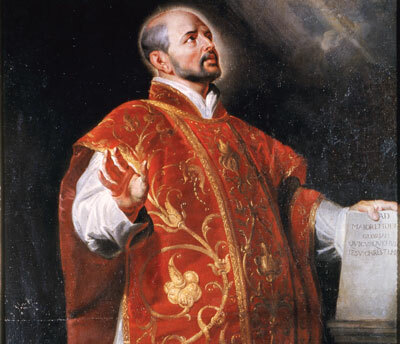 Ignatius of Loyola was born in 1491 into a noble Basque family in northern Spain. During his youth, he served as a soldier in the Spanish army and had the experience of life at the royal court of King Ferdinand. In 1521, while defending the castle of Pamplona against the French, a cannon ball shattered his leg. It was during the ensuing long and painful convalescence that he experienced an inner transformation that made him renounce his ambitions of knightly glory and dedicate himself to love and serve Jesus. On recovering from that painful experience, he went to Manresa. He spent a few months in a cave living a life of intense prayer, mortification and reflection on the life and teaching of Jesus. He realized that he needed education to be more effective in his mission of service. This led him to schools of learning in Spain and later to the University of Paris. It was here that he gathered around him a group of friends who later became his followers. Finally, in Rome, in 1540, Ignatius formally founded the Society of Jesus, and his companions came to be known as the Jesuits. Ignatius was elected its first General or Superior. He passed away at the age of 66 on July 31, 1556. Ignatius himself started several schools and colleges to educate the youth. Today the Jesuits are spread all over the world, committed to a life of service of people through different types of work.